Angiogenesis is a physiological process in which new branches and the network of blood vessels are generated in the tissues. Although angiogenesis is essential for living bodies, it is also involved in a variety of diseases. For example, cancers induce the formation of vascular networks to supply energy and nutrient to themselves. In vivo experiments using animal models have been prevalent for the research of angiogenesis. However, it is often difficult to obtain quantitative and reproducible data in such experiments, and the low throughout makes them unsuitable for drug discovery screening. On the other hand, in vitro culture assays are useful for drug screening because such systems allow strict control of the experimental conditions. 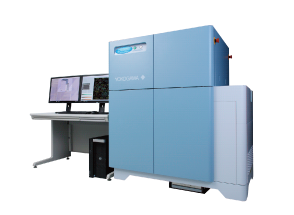 CQ1 enables automated high-throughput in vitro assays. This application note shows an example of the analysis of the angiogenesis by cultured HUVEC in Matrigel. Figure 1. Vascular network-like structure formed by HUVECs. (A) A whole-well image showing the network formed by cultured HUVECs in Matrigel. (C and D) Higher magnification images of the areas (white frames) in (A) and (B), respectively. Human umbilical vein endothelial cells (HUVECs) were incubated in the serum starvation condition (1 % FBS) for 24 hours. Cells were seeded in a Matrigel-coated, 96-well microplate (10,000 cells/well). After incubation (4 hours) to allow them to form blood vessel-like networks, Suramin (0 – 50 µM) and CellTracker Red (5 µM) were added to the culture medium and cells were incubated for an hour at 37℃. Images were acquired with CQ1 (4 x objective, 561 nm laser). Maximum intensity projection (MIP) images were constructed from 12 z slices (764 µm from bottom to top), then whole-well images were reconstructed from four adjacent images. The images were analyzed in the CQ1 software. Suramin is a reagent which is known as an inhibitor of angiogenesis in a dose-dependent manner. (A) Control well. The network formed by HUVECs covers the whole-well. (B) The well treated with 50 µM Suramin. The network is largely disrupted. 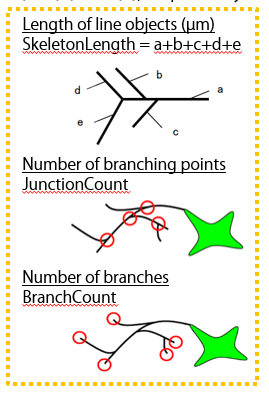 Images were analyzed using Skelton function in the CQ1 software and dose-response curves were constructed for the effects of Suramin on length of the line objects (left), the number of branching points (middle) and number of branches (right) per well. 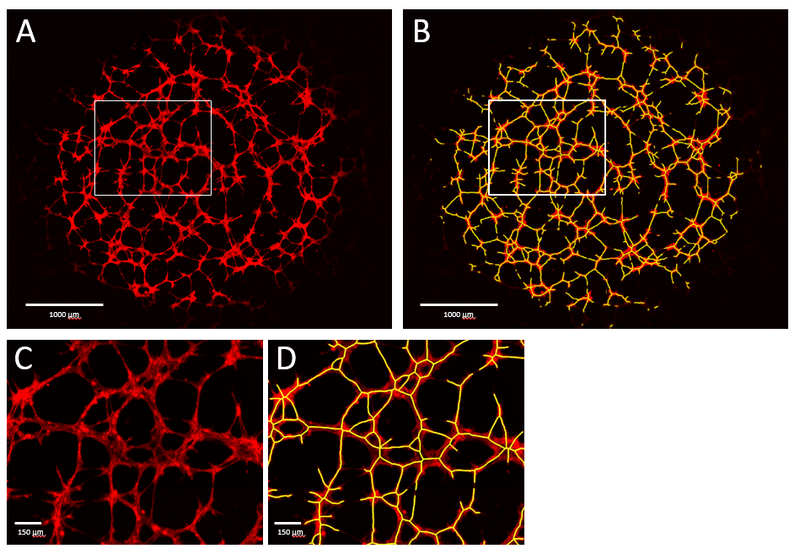 The effects of Suramin on the vascular network-like structure formed by cultured HUVECs were analyzed and quantified using CQ1. 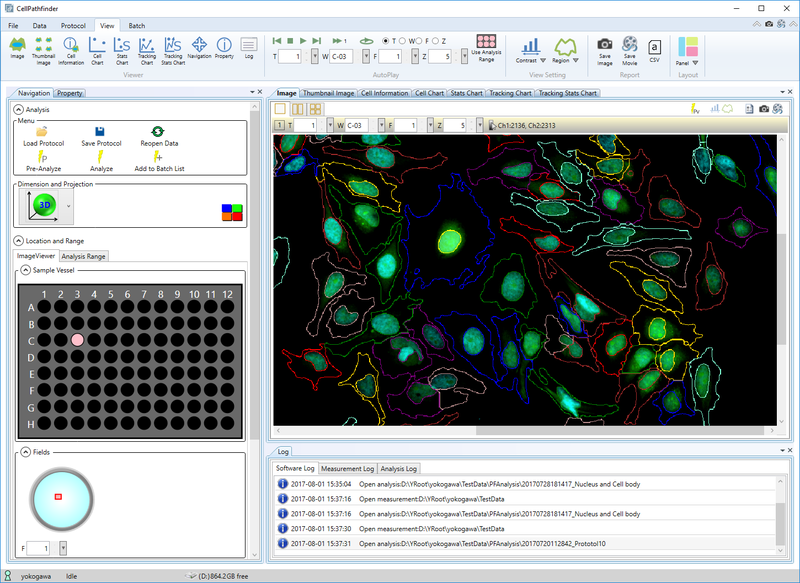 Users can easily make automated procedures from image acquisition through image analysis in CQ1. By using such procedures, users can effectively collect quantitative and reproducible data in high throughput. 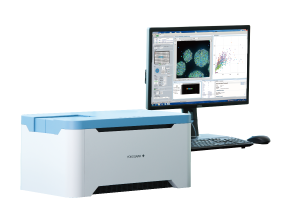 Even in the case of the samples like the vascular network in Matrigel, where cells are distributed in the coating material with uneven thickness, CQ1 can capture the complete three-dimensional structure of the network by acquiring z-stack images without missing out-of-focus cells. 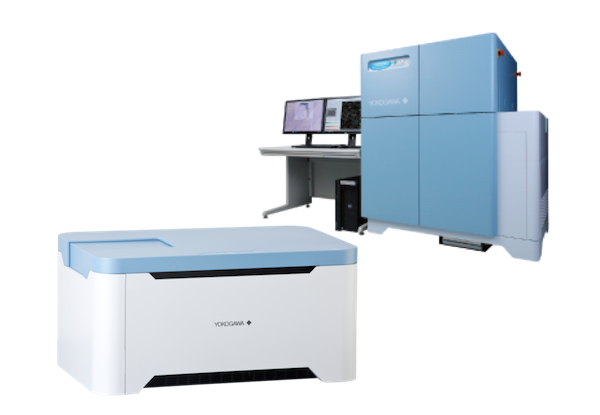 The microlens-enhanced dual Nipkow disk confocal system in CQ1 cause only a very low level of photobleaching and phototoxicity on the samples. This feature allows repeated image acquisitions in CQ1 with a minimal damage to the samples. A tiled image which consists of four fields acquired with the 4 x objective lens in CQ1 covers a whole-well in a 96-well microplate. CQ1 software can generate a large field image by stitching images of adjacent fields. Analysis of the tiled images would provide more realistic results avoiding possible errors caused by analyzing each field separately. The dynamic process of angiogenesis can be investigated in the time-lapse live cell imaging using CQ1 with optional environmental control system.